Opposite me on the MRT is a young couple, both busy in reading Inquirer Libre. One thing that caught my attention is the girl’s excessive hairy arms and legs. Even she’s wearing a dark stockings, her exaggerated hair can be seen. One thing that is freaky is that she looks like she’s shaving her facial hairs. From the side-burns area, beard and moustache. She’s a newly-shaven woman that hasn’t perfected yet the science of shaving. You need more practice lady! The next time I see her, I would take some pictures of her. Hehe. 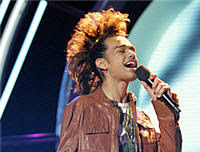 Anyway, speaking of hair, I just remember how horrible Sanjaya Malakar’s hair was on this week’s American Idol performance night. Sanjaya on Mohawk?!? Oh my God! What’s wrong with him and his stylist in American Idol? Are they making fun of him or it’s his idea? Silly Sanjaya! Too bad he wasn’t eliminated. Sanjaya indeed has a large fan base or the Anti American Idol is sabotaging the voting. Too bad if Sanjaya is the next Taylor Hicks in a making.